Yes folks, it is new month time again. 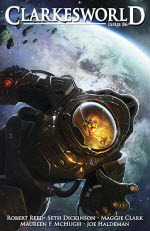 In issue #58 of Clarkesworld we have a whole lot more reading goodness for you. Gord Sellar should be well known to you as he’s been a Campbell nominee. His story, “Trois morceaux en forme de mechanika”, might have a French title, but don’t worry, the text is all in English. An Owomoyela is yet another Clarion West graduate whose work I need to catch up with. “Frozen Voice” is a story about language and oppression. Jeremy may have taken leave of his senses this month because he’s doing a round table interview featuring no less than 28 different writers of epic fantasy. His guests include Steven Erikson, Trudi Canavan, David Anthony Durham, N. K. Jemisin, Patrick Rothfuss, Juliet McKenna, Brandon Sanderson and many others. Unsurprisingly this is only part one of the resulting article. As in all the best epic fantasy novels, Jeremy includes a dramatis personnae so that you can keep track of all of the characters. I’m hoping he doesn’t intend to do a GRRM, as many of those people are good friends of mine. Also in this issue, Neil has an editorial in which he vents a bit about the constant push-back you get whenever you mention ebooks. I said many of the same things on panels at Eurocon and Alt.Fiction. 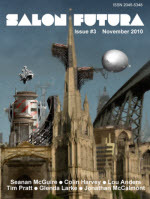 One of the things Neil mentions is the option that Kindle users now have to order a subscription to Clarkesworld. I’m pleased to hear that these are selling well, and very much hope we reach the target of 500 subscribers that we need to finance an additional story each month. Of course if your ereading device/software supports epub rather than mobi you can buy the new issue from the Wizard’s Tower store. We also have Lightspeed #14 and Fantasy #52, with the usual offer of 25% off if you buy both together. 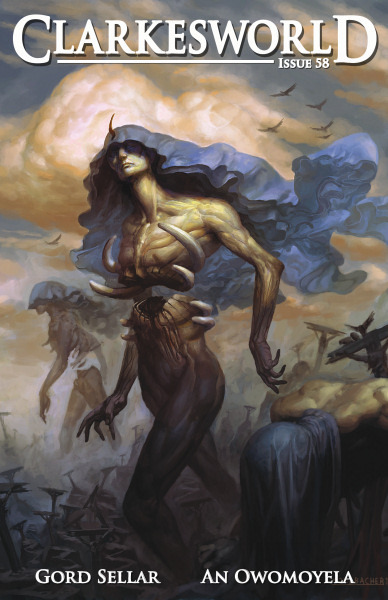 And finally, this month’s cover is “Valley of Mists” by Peter Mohrbacher, which I love so much I’m reproducing it in full here. This entry was posted in Clarkesworld, Wizard's Tower. Bookmark the permalink.